Do you suffer with pain in your Shins? Shin pain is a common complaint in athletes, sport participants and active individuals. Pain along the inside of the shin has been historically termed ‘shin splints’. However, there are many different injuries which come under the umbrella of ‘shin splints’. Accurate diagnosis is needed if treatment is to be successful. Shin pain should not be ignored and early and appropriate treatment will help to ensure a full and speedy recovery. 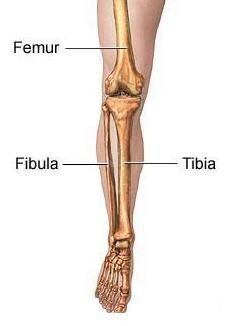 The lower leg consists of two major bones, the tibia (shin bone) and the fibula. Many different structures originate from these bones, including muscles, ligaments and tendons. This means there are a large number of possible causes of shin injury and pain. 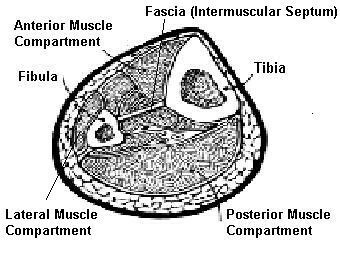 The lower leg can be divided into three compartments, which are separated by a thin barrier known as fascia, as shown below. Each of these compartments has its own nerve and blood supply. So what does shin pain / shin splints feel like? Many people experience pain that gets worse with activity and is relieved by rest. The activities that are the most likely to cause shin pain are running, jumping, climbing up an incline or stairs, or running down a hill. The pain is often described as an ache sensation. Pain located on the medial (inside) or lateral (outside) part of the lower leg. Running or other weight bearing exercise tends to make the pain worse. Activity on hard surfaces (roads or concrete) or on tight turns on running tracks can aggravate the pain. If this is you, then you’re not alone. Shin pain is an incredibly common bio-mechanical problem of the foot and leg. Having shin pain is not normal. In fact, there is absolutely no such thing as ‘normal’ shin pain. Pain is a warning sign that tissue damage has occurred or is about to occur. You see, pain in your shin is your body’s way of telling you that something is wrong! If you have shin splints, don’t ignore it, seek professional help. It is unlikely to resolve on its own and the longer you wait to seek treatment the longer and harder it can be to fix. So what causes shin pain? Shin pain can occur in people with high arched or flat feet. A high arched foot has limited shock absorption for the leg, which increases pressure and strain on the bone (tibia). With excessively flat feet the muscles of the lower leg are required to contract longer to compensate for the flat foot position. This results in muscle fatigue and a decrease in lower leg shock absorption. Over time this may lead to inflammation and increased strain on the bone, or even a stress fracture. How can I fix my shin pain? Initially, treatment consists of rest, training modification, physical therapy (such as massage and stretching) and avoiding aggravating activities to allow the inflammation to settle. You cannot simply ‘run it out’. To fix the shin pain you must reduce the strain on the shin bone (tibia). This means correcting the factors that predispose you to shin strain and injury. By using gentle, ‘hands-on’ specialised techniques called Foot Mobilisation Therapy (FMT), we can correct the joint displacements. This puts the structure of the foot back into the correctly aligned position and reduces the pressure and strain on the shin bone (tibia). By using specific corrective exercises the muscles around the foot and leg can become flexible and strong again. Together this allows the body’s natural healing processes to repair the damage tissue. As a result you to move and run again without shin pain. Ice massage– to further decrease inflammation in the region. Training Program Review– including training surfaces, frequency of training and cross training. If you suffer from shin pain seek professional advice. Remember shin pain is not normal and identifying and treating the cause of your shin pain will ensure you get back on your feet fast.